Harry Arthur "Cookie" Lavagetto (December 1, 1912 – August 10, 1990) was a third baseman, manager and coach in American Major League Baseball. He was the pinch hitter whose double ruined Bill Bevens' no-hitter in Game 4 of the 1947 World Series and gave his Brooklyn Dodgers a victory over the New York Yankees, a game known as The Cookie Game. On October 3, 1947 at Ebbets Field, Bevens was ahead 2–1 going into the bottom of the ninth inning, and got two outs. He had surrendered no hits — an unprecedented World Series achievement at the time — but two runners were on base from Bevens' ninth and tenth walks of the game. 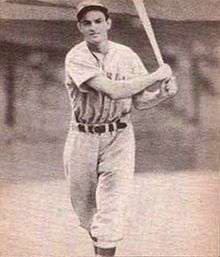 Lavagetto was summoned by Dodger pilot Burt Shotton to hit for Eddie Stanky, and with no balls and one strike cracked an opposite-field double off the right field wall to break up the no-hitter and score the two Dodger runners (pinch runners Al Gionfriddo and Eddie Miksis) for a 3–2 Brooklyn win. It was Lavagetto's only hit of the series (won by the Yankees in seven games), and his last as a big leaguer. Lavagetto was born in Oakland, California. Nicknamed "Cookie" after an owner of the Oakland Oaks, his first professional team, he played ten seasons in the National League with the Pittsburgh Pirates (1934–36) and Brooklyn Dodgers (1937–41; 1946–47), missing four full seasons due to military service during World War II. A right-handed batter and thrower, he hit .269 in 1,043 games; his best season was 1939, when he hit .300 with 87 runs batted in for Brooklyn. After being released by the Dodgers following the 1947 Series, Lavagetto returned to Oakland to finish his playing career with the Oaks (1948–50). When Oakland manager Chuck Dressen was named the field leader of the Dodgers in 1951, Lavagetto accompanied him and returned to Brooklyn as one of his coaches. He was an aide to Dressen with Brooklyn (1951–53) and the Pacific Coast League Oaks (1954), and followed him a third time as a member of the coaching staff when Dressen became manager of the Washington Senators in 1955. But on May 7, 1957, with the Senators foundering in last place, Dressen was fired and Lavagetto named his successor. The team improved slightly, but finished last in 1957, 1958 and 1959. Finally, in 1960, Lavagetto's Senators rose to fifth place in the eight-team American League. The club featured promising young players such as Harmon Killebrew, Jim Kaat, Earl Battey and Bob Allison, as well as veteran pitcher Camilo Pascual, just entering his prime. But the Senators' encouraging 1960 season came too late to keep the franchise in Washington; owner Calvin Griffith moved the club to Minneapolis–St. Paul, where it became the Minnesota Twins. Lavagetto was the first manager in Twins' history, but he did not finish the 1961 season. With the Twins mired in ninth place in the new ten-team AL, he took a seven-game leave of absence in early June and then returned to the helm. But he was fired June 23 with the club still in ninth place. He was replaced by coach Sam Mele, under whom the Twins became pennant contenders in 1962 (finishing in second place to the Yankees) and pennant winners in 1965. Lavagetto, as manager for the so-called "Griffs", won 271 and lost 384 (.414). Lavagetto then returned to the coaching ranks with the New York Mets (1962–63), and — back home in the Bay Area — the San Francisco Giants (1964–67). He died in his sleep at his home in Orinda, California, at the age of 77.